Young Writers and Kelley Armstrong Fans: Don’t Miss This Event! Story Planet invites young writers and fans of YA fiction to join us for an evening with Kelley Armstrong, author of urban fantasy series Darkness Rising. On March 6th at 6:30pm, Kelley will be visiting the Story Planet ITA to read from her novel The Gathering. Following the reading, guests can take part in a question period. This is a great chance for fans to discuss Darkness Rising with the author herself, and for young writers to chat with a bestselling author. Reserving a spot is easy: just send an e-mail with your name (if you’re coming with a group, you can include their names too) to Story Planet’s Kaleigh Wisman. Take part in our Q&A with Kelley Armstrong Story Planet is looking for a few special fans to facilitate the question period during Kelley’s visit. Facilitators will guide the Q&A by choosing whose turn it is to ask a question. If you’re interested in taking on this volunteer role, we’d love to hear from you. Join the Live Tweet Can’t make it to the reading? Story Planet will also be live tweeting the event. If you have a special question for Kelley, tweet it to @StoryPlanetITA today! We’ll be taking questions up until March 6th, when we’ll be live tweeting Kelley’s answers. Join us on Twitter March 6th to read live tweets during the event! You can help us spread the word by sharing this event on Facebook and Twitter. Do you have questions about this event, or ideas for our next one? Add your comments to the discussion by using the text box below. Directions for Intergalactic Travellers Story Planet is located at 1165 Bloor Street West. Simply hop into your space vehicle and navigate your way to Dufferin Station. Upon emerging from the station, cross the street and search for the number 1165. You can also use this handy map to find us! 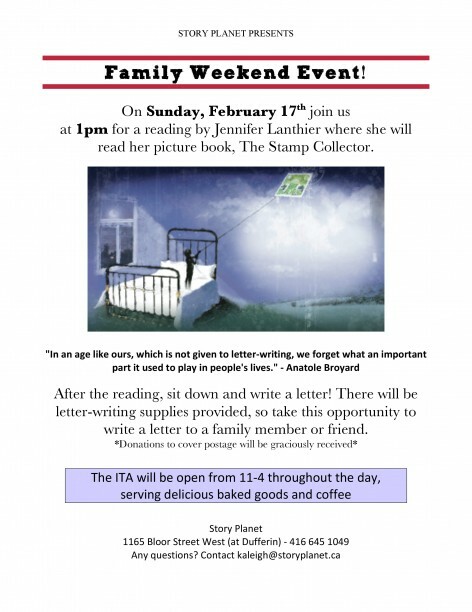 Join us this Sunday, February 17th for a reading of The Stamp Collector and a letter-writing session (when was the last time you sat down to write someone a letter?!). This beautiful book is geared at kids 8 and up, although all ages and families are welcome to attend. The incredible Michelle inspires countless Story Planet students and reaches her 100th hour with us! Thank you for all you do, Michelle!